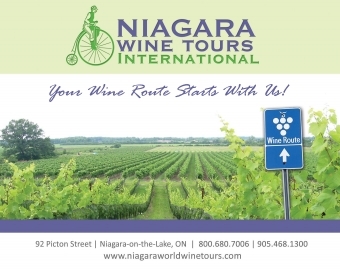 Get "Off the Beaten Path" to create memories that last a lifetime with Niagara Wine Tours International! Crafting fresh, creative experiences with culinary, wine and craft beer throughout Niagara since 1992! Discover the hidden gems that make Niagara Wine Country such a unique destination with country roads lined with rolling estate vineyards and orchards. Leisurely sample world-class wines, tour by bicycle, passenger van, Double Decker and coach bus; offering afternoon, lunch or dinner daily tours; bike rentals & cycling by season. Planning conference events, family reunions, or celebration weekends; our knowledgeable team, creatively deliver fresh experiences, exceptional service to customized itineraries meeting both budget and time frames.